On the whole workers' strikes are usually associated with miners, train drivers, postal workers and factory workers,. Quite a lot of the time these guys are given a hard time by corporations, even though they provide a vital service to the operation of the company. But as you are all too familiar with these stories in the media, I thought I would highlight some interesting and more unusual strikes that have occurred over the years in some pretty well known institutions. Although Disney artists were the best paid in the motion picutre industry during the 1930s, there was discontent. Many of the employees had given Disney large quantities of free overtime during the drive to complete the 1937 Snow White, and despite the fact that Snow White was an enormous success, instead of getting the bonuses they had been vaguely promised, they were faced with a layoffs. Accordingy to Richard Schickel, "An animator working on Fantasia took piano lessons at his own expense" and when Walt Disney found out about it, he allegedly snarled, "What are you, some kind of fag?". Disney became an obvious target for the Screen Cartoonists' Guild, and on May 29, 1941, a strike began. The strike actually occurred during the making of the animated feature Dumbo, and a number of strikers are caricatured in the feature as clowns who go to "hit the big boss for a raise". The strike lasted five weeks and was settled by a federal mediator in the Guild's favour. In the years following World War I, inflation dramatically eroded the value of a police officer's salary. From 1913 to May 1919, the cost of living rose by 76%, while police wages rose just 18%. After repeated requests, the American Federation of Labor (AFL) began accepting police organizations into their membership in June 1919. The Boston police rank later went on strike on September 9, 1919. Of the force's 1,544 officers 1,117 (72%) failed to report for work. 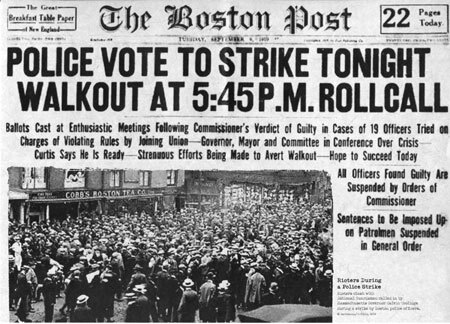 During the strike, Boston experienced several nights of lawlessness. Several thousand members of the State Guard restored order. The strikers were called "deserters" and "agents of Lenin" by the media. The strike ultimately failed, as the Police Commissioner refused to re-hire the striking policemen, instead training new recruits. His decision was supported by Massachusetts Governor Calvin Coolidge. The new recruits reeived the higher wages and extra vacation time sought after by the strike force. Through its grassroots efforts—utilizing consumer boycotts, marches, community organizing and nonviolent resistance—the grape workers movement gained national attention for the plight of some of the nation's lowest-paid workers. The strike began when the Agricultural Workers Organizing Committee, mostly Filipino farm workers in Delano, California, walked off the farms of area table-grape growers, demanding wages equal to the federal minimum wage. One week after the strike began, the predominantly Mexican-American National Farmworkers Association, led by Cesar Chavez and Dolores Huerta, joined the strike, and eventually the two groups merged, forming the United Farm Workers of America in August 1966. The stike began on September 8, 1965, quickly spread to over 2,000 workers within a week, and lasted more than five years. 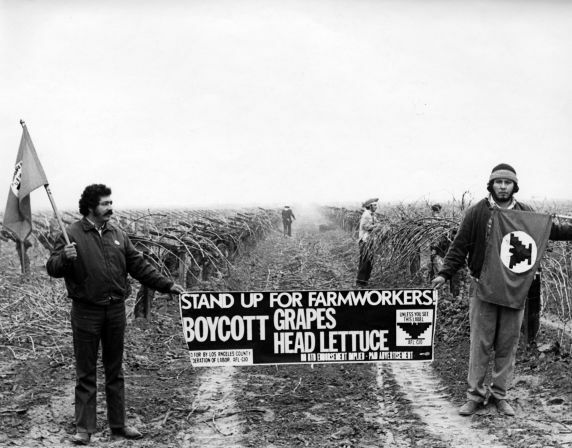 The strike was a significant victory for the UFW, leading to a first contract with the grape growing corporations. In April 1977, the brewery workers union at Coors, representing 1,472 employees, went on strike. The brewery in Golden, Colorado, kept operating with supervisors and 250 to 300 union members, including one member of the union executive board who ignored the strike. Soon after, Coors announced that it would hire replacements for the striking workers. In December 1978, the workers at Coors voted by greater than a two to one ratio to decertify the union, ending 44 years of union representation at Coors. Because the strike was by then more than a year old, striking workers could not vote in the election. Labor unions organized a boycott to punish Coors for its labor practices. One tactic employed was a push for state laws to ban sales of unpasteurized canned and bottled beer. Because Coors was the only major brewer at the time not pasteurizing its canned and bottled beer, such laws would hurt only Coors. The AFL-CIO ended its boycott of Coors in August 1987, after long negotiations. The Colour Strike was an industrial action by technicians at all ITV companies from 13 November 1970 to 8 February 1971 who due to a pay dispute with their management, refused to work with colour television equipment. 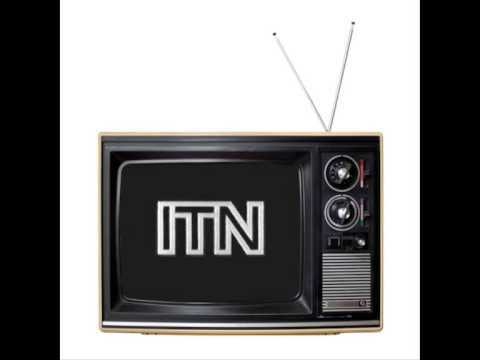 At that time ITV had recently switched to colour transmissions, requiring the individual companies to invest heavily in new equipment. Some early colour television studio cameras consisted of four tubes to relay the picture: three were receptive to colour with the fourth providing a high-resolution monochrome image which was still required as many viewers still watched on monochrome receivers. The technicians simply switched off the colour tubes whilst this dispute took place. This meant that even though colour equipment was available, all shows were recorded and broadcast in monochrome, thus denying the ITV companies the ability to sell airtime at the higher value that colour transmissions dictated. 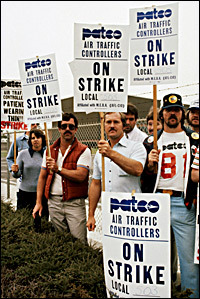 On August 3, 1981 the Professional Air Traffic Controllers Organization (PATCO) declared a strike, seeking better working conditions, better pay and a 32-hour workweek. In doing so, the union violated a law that banned strikes by government unions. Ronald Reagan declared the PATCO strike a "peril to national safety" and ordered them back to work under the terms of the Taft-Hartley Act of 1947. Only 1,300 of the nearly 13,000 controllers returned to work. Subsequently, Reagan demanded those remaining on strike return to work within 48 hours, otherwise their jobs would be forfeited. By prioritizing and cutting flights severely, the government was initially able to have 50% of flights available. On August 5, following the PATCO workers refusal to return to work Reagan fired the 11,345 striking air traffic controllers who had ignored the order, and banned them from federal service for life (this ban was later rescinded by President Bill Clinton in 1993). The 1992 NHL players' strike was the first Strike action initiated by the National Hockey League Players' Association (NHLPA) against the National Hockey League's (NHL) owners. It was called on April 1, 1992 and lasted ten days. The settlement saw the players earn a large increase in their playoff bonuses, increased control over the licensing of their likenesses and changes to the free agency system. In addition, the season was expanded to 84 games and included provisions for each team to play two games per season in non-NHL cities. As a result of the strike, the owners removed John Ziegler as President, replacing him with Gil Stein. The strike fundamentally altered the relationship between the league and its players.